I'm sure in that ridiculously long string of letters, there's a few different words in there like "gum", disgusting", and "unhappy". Trust me, I have pretty long last name myself ("Papadimoulis"), so I know a thing or two about this. Why not use spaces? Or at the very least, hyphens? My regular camera is still out of commission (which is why there's no hockeypulver), but my cellphone was able to snap some unexpectedly detailed pictures of this salmiakki. As you may tell, it looks like regular, candy-coated gum. It also has the exterior texture of real gum, but certainly not the smell. I'd normally expect some form of mint when taking a whiff, but these have a more neutral and (of course) subtle liquorice smell. 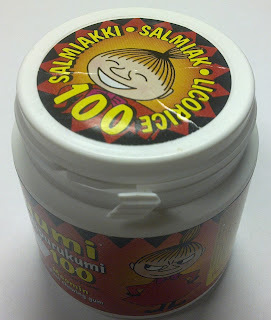 I'm generally not afraid of salmiakki-based gum, and the Ksylitolipurukumi gave me no reason to change my mind. It started off with a light liquorice taste but quickly faded into nothing. After chewing on several flavorless pieces for a while, I spit the gum out and took a swig of water to combat the salty aftertaste. Maybe I'm getting used to this stuff, but I have to score the Ksylitolipurukumi as edible. Ugh, salmiac gum is a pretty ridiculous idea. By the way, there's a typo in the title. Finnish does love its compound words. 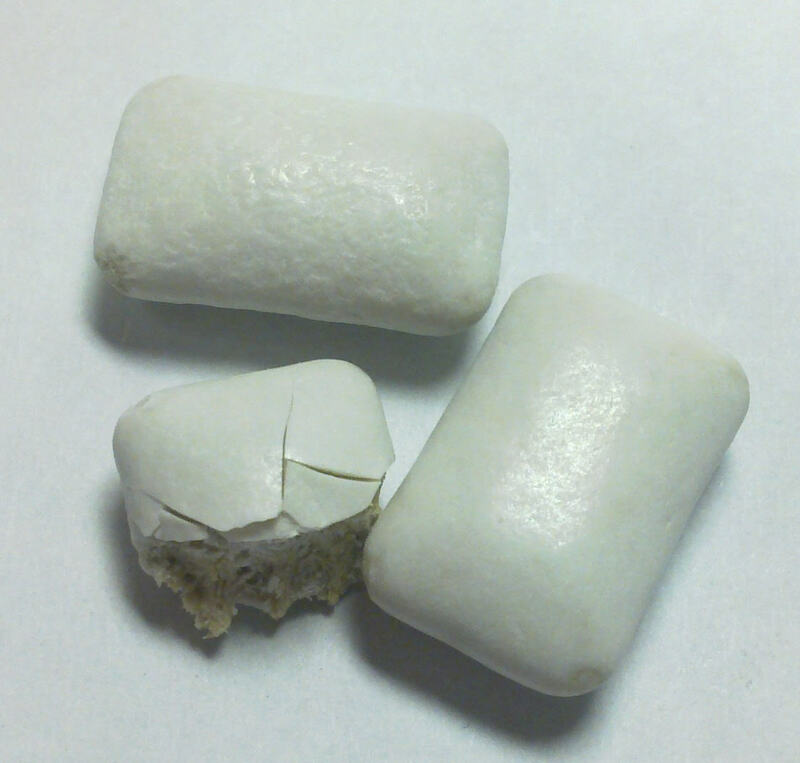 "Xylitolipurukumi" breaks down to "Xylitoli-puru-kumi" which translates into "Xylitol chewing gum". So, you got "gum" right, at least. And yes, there's a typo in the title, it's meant to be "_Muumi_ Xylitolipurukumi". Don't forget that xylitol after eating is good for your teeth! Nice to see you got your courage back and are starting back up the ladder towards real salmiak products after these... "salmiak" products. Remember; if it doesn't burn holes into your tongue, it's not real salmiak! Maybe your stock of salmiakki is getting so old that some of the products are losing their taste? Ha ha! Also a little detail of my dear home country: in many towns, the street signs are written in Finnish and Swedish (we're bi-lingual). Many tourists think we have ridiculously long street names so that they have to be written in two rows (in reality, one row is for Finnish and one row is for Swedish, e.g. Finnish is certainly something. I'm Norwegian, and I've only spent a month in Helsinki ... so let's see what I can pick apart. Given "three" and "kilowatt", I guess it's three-phase something? Four-color rotating offset printer, or something in that direction? Dnebdal is right on the money, and pretty good for one month with the language. Not sure about the exact English translations but kolmivaihekilowattituntimittari is an electricity meter that you will find in regular households: three-phase kilowatt hour meter. Nelivärirotaatiolaakaoffsetpainokone: correct, and laaka refers to some sort of flatbed position. Another interesting compound word: hääyöaie. - Yöpöllö kyttäämöllöttää yökyöpelinä pyökkiyökkösiä äkämöivässä työkyökissään. - Kokooko koko Kokko koko kokon kokonaan koko kokoonsa ? - Kokko! Kokkoo koko kokko! - Kokko (name)! Put that bonfire together! - The whole bonfire (stating tone). Actually there is no theoretical limit of how long compounds you can make in finnish. But that is, of course, the case with many languages. The 102 letter word that Reiska gave is actually complete gibberish, there is, nor can be, any use for it. But it is within finnish grammar. I find it especially funny that you dislike most variants of salmiakki, as my miniature poodle has a positive craving for it, especially the hotter variants of Turkinpippuri candy! He can't enough of salmiakki! - Pöllö Pöyliöstä löysi yöpöydältään pölyttyneen läksiäismöttösen päällyskääreet. - Vääräsääri Väänänen rääkyy läävässään hääpäivänään näpräten päämäättä näärännäppyjään. - Ällöttävän yö-öylätin löperyys ällistyttää äidin öljyämpärissä köllöttävää ähkyistä pääjalkaismönkiäistä. Teach those to German or American in pub at 2:00 am. "Trust me, I have pretty long last name myself ("Papadimoulis"), so I know a thing or two about this. Why not use spaces? Or at the very least, hyphens?" Writing it with spaces is as stupid as write xylitolchewinggum in English. :-P Meaning of the word can also change. Like "isoäiti" is grand mother but "iso äiti" is just big size mother. Hyphen is used only if the second word starts with the same vocal the first ends. Like "salmiakki-ihanuus" (=salmiak sweetness).